It should be understandable that since I was born in Buenos Aires I would consider Argentine women as the most beautiful and sophisticated anywhere. In recent trips to Buenos Aires from here in Vancouver I can at least attest that those Argentines dress better. I bring a lot of baggage from my past in that assertion in the paragraph above. My mother said that Argentines, particularly men were courteous to women. At the same time I knew that my mother, who had a perfect figure, wore a girdle. She wore one as we did not own a car and she traveled in colectivos, small city buses. She wore that girdle as protection from pinching of her behind by those “courteous” men. One of the most beautiful women I ever met in Buenos Aires was my first cousin, the red haired Elizabeth Blew. I fell in love with her when I was 21 and a conscript in the Argentine Navy. I was not too attractive (so I thought) in my short haircut. But I did manage to have lunch with her once at a corner boliche (restaurant-bar). Her accent, much like the Queen’s (and you must know which one it can only be) was enhanced by an almost identical voice to that of Joan Greenwood’s with a blend of Deborah Kerr. It was the sudden appearance of a very tall and burly man in a army uniform (her boy friend was of Norwegian origin and was a conscript, too) that held me at bay. I subsequently had two Argentine girlfriends. One had freckles but both sounded like the Queen. Since my days in Argentina I have not had the good fortune of taking pictures of many Argentine women – only three or four. All are or were living in Vancouver. One of them, Mónica Salvatella, lives on the Sunshine Coast. 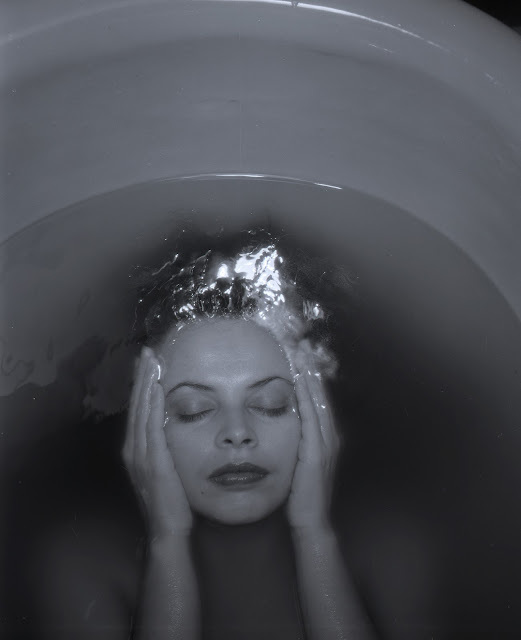 Salvatella posed for me in my basement bathtub as part of my 1989 tub series. She was brought by a friend to our Thursday afternoon lunches at the Railway Club. She had slightly and most endearing buck teeth and a luscious mouth that pouted.